Big landscapes can be tricky to squeeze onto little pages but few people want to carry a large sketchbook around. Fortunately there’s a simple solution: sketch across both pages. Many people are initially reluctant, even intimidated, about drawing over the middle ‘gutter’ but once you give it a go, you’ll find it liberating to sketch freely across both pages. 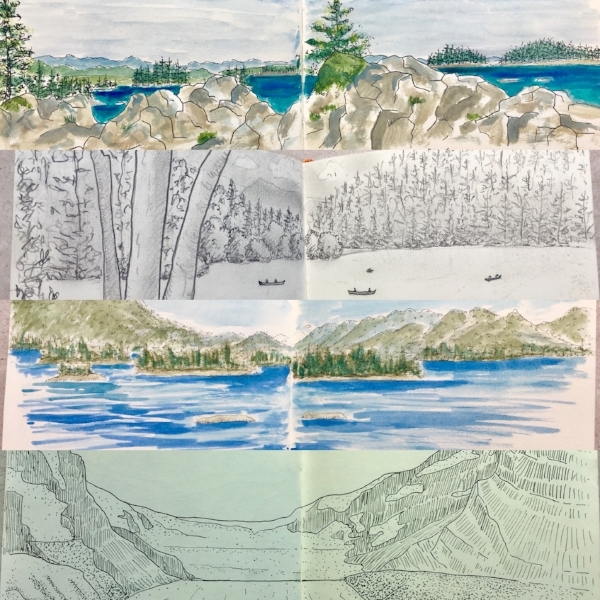 All of these ‘big landscape’ doodles were made in my tiny 6.5 inch square sketchbook. Try it and see how you get on.